SB ඇමති තුමා බොහෝම තැන්පත් ලෙස කරුණු දක්වා කතාකරන්නත් දන්නව නේ! එතුමාගේ කථාව අපිද ඉත සිතින් අනුමත කරමු. වෙසෙසින් අර අන්තිමට කිව්ව ටික​. නෙවිල් ප්‍රනාන් දු මහතා මේ වගේ දැවැන්ත නිර්මාණයක් කරන්න​ මේ වගේ රටක ගත්ත රිස්ක් එක පුදුමයි. අන්තිමට වෛද්‍ය සභාවට (හා GMOA එකට​) ඉතුරු උනේ තම කුලයේ නිරුවත ජනතාව දැනගැනීම පමණයි. @Chinwi wrote: SB ඇමති තුමා බොහෝම තැන්පත් ලෙස කරුණු දක්වා කතාකරන්නත් දන්නව නේ! But what about these facts? Why only SAITM don't want to sit for ERPM exam to prove they good enough to practice? ALL foreign degree holders, and Sri Lankan uni students sit for same exam. I think it is not that way. SL Uni students do not sit for the exam conducted for foreign students. ERPM. There is no way to measure or evaluate the actual training given in all the remote places in other countries. This was the reason for conducting a separate exam for foreign qualified doctors to re-clarify the knowledge gained from foreign countries. Only the doctors graduated from foreign medical schools recognized by the SLMC are allowed to apply for ERPM. Most of other countries also have their own examinations for foreign doctors who wanted to practice in their soil. As SAITM is in our soil, offer degrees here similar to other local Universities under UGC, our authorities cannot ask SAITM doctors to sit for an exam conducted for foreign entries. They should formulate a suitable way to measure the training as they do with other local Universities. As SAITM is in our soil, offer degrees here similar to other local Universities under UGC, our authorities cannot ask SAITM doctors to sit for an exam conducted for foreign entries. ලංකාව ඇතුලෙ ඉඳන් පෝස්ට් හදන ලිං මැඩියන් ගේ ලෝකයට වඩා ඇත්ත ලෝකෙ වෙනස්. Present evidence that their intellectual and personal credentials are of such quality as to predict success in the study and practice of medicine. Demonstrate aptitude in the biological and physical sciences during their undergraduate years, but not to the exclusion of the humanities and social sciences. ඕස්ට්‍රේලියාවෙ ඉන්නව මම දන්න ලාංකික දෙදෙනෙක්. එක් අයෙක් ප්‍රධානතම විශ්ව විද්‍යාලයක ආර්ථික අංශයේ පීඨාධිපති වරයෙක්. ඔහු ලංකාවෙ A/L වලින් පස්සේ මරදානෙ ටෙක් එකේ තමයි ආර්ථික / වානිජ්‍යය විශය ඉගෙනීම ඇරඹුවේ. තව අයෙක් කන්සල්ටන්ට් වෛද්‍ය වරයෙක්. ඔහුගේ පලාතේ පාසල් අනුව වානිජ අංශයෙන් ලංකාවෙ උසස් පෙල කරන්න උනා. උපාධියත් ඒ අංශයේ. නමුත් වෛද්‍ය සේවයටයි කැමැත්ත​. පසුව විදෙස් රටක දී පශ්චාත් උපාධි අද්‍යයන හා වෙනත් ස්වේච්ඡා සේවා කර එම රටේ වෛද්‍ය අංශයෙන් ඉගෙනුම ලැබීමට ඇතුල්වීමේ සුදුසුකම් ලබා ගත්තා. ඔහුට ලංකාවේ වැඩ කරන්න දුන්නෙ නෑ රජයේ වෛද්‍ය මාෆියාව​ ලංකාවෙ A/L පාස් නැති කෙනෙක්කොහොමද දොස්තර වෙන්නෙ. සල්ලි දීල හොර සහතික අරන් ඇවිත් කියල​ . අද ඔහු රටවල් කිහිපයක ඉහලින්ම පිලිගත් දක්‍ෂ​ වෛද්‍ය වරයෙක් හා වෙද විදුහල් විසිටින්ලෙක්චරර් කෙනෙක්. තව මම කලිනුත් ලිව්ව අද ලංකවෙම වෛද්‍ය සේවයේ අති දක්‍ෂ ලෙස සේවය කරන , උදේ හවස මුදල් පස්සෙ නොදුවන වෛද්‍ය තුමියක් ඉන්නව . එයත් ලංකාවෙ හෝ ලෝකෙ කොහේ හෝ අපේ වගේ බයෝ ධාරාවෙන් උසස් පෙල කරල නෑ. ඒ වෙනුවට විදෙස් රටවලදී සමාජයීය විශයයන් හා රසායන විද්‍යාව තමයි හදාරලා තියෙන්නෙ. නමුත් කොළඹ වෛද්‍ය විද්‍යාලයේදී ඇගේ වෛද්‍ය අධ්‍යාපනයේ සම්හර විශයයන් වල ලකුණු අපේ A/L ඉහලින්ම පාස් අයටත් වඩා හොඳ උනා. එයට එකම හේතුව පැහැදිලි මනස හා ඉංග්‍රීසි භාෂාවේ හැකියාව​. ඇයව එහි ඇතුල් කරගන්න යම් නීති තත්ත්වයක් මත රජයට සිදු උනා. අදටත් කවුරුත් නොදන්නවට ලංකවේ A/L අයට අමතරව යම් කුඩා ප්‍රතිශතයක් එසේ රජයේ වි වි වලට ​ගන්නව​. GMMO & JVVP always tried to abolish SAITM. They didn't want to improve the quality of SAITM. So SAITM got the advantage of these silly people. If they have tried to improve the quality they(SLMC) could introduce the ERPM or any other exam equivalent to government final medical exam to check their quality. Now according to education minister there are 5 private medical institutions( including Manipal India) planning to start medical education in Sri Lanka. Then how SLMC check their quality without asking them to sit a exam like ERPM? Unlike studying Medicine in Europe, studying medicine in the U.S.A. generally begins after completion of four years of undergraduate study which includes meeting the pre-medical school course requirements along with obtaining a bachelor's (B.A.) degree in any subject. Medical studies in the U.S. In the U.S., medical degrees are considered second entry degrees, meaning you cannot enrol directly to a Bachelor degree in medicine. You need a Bachelor (undergraduate) degree in order to apply to medical school. Then, you can enrol in a complete and progressive medicine study degree that usually lasts four years. Candidates taking the International Baccalaureate Diploma (IB) must offer three subjects including Chemistry and Biology at Higher Level, plus three subjects at Standard Level. Medicine is a very competitive discipline, requiring high grades particularly in science subjects as well as a high standard of English. Three full A Levels, or equivalent, is the minimum requirement. Chemistry is nearly always essential and biology is often a specific requirement. The entry requirements of all publicly funded UK medical schools can be found in this MSC booklet. UK medical schools usually accept International Baccalaureate and European Baccalaureate qualifications. Some medical schools require that you take additional tests such as the UK Clinical Aptitude Test (UKCAT), the BioMedical Admissions Test (BMAT) and the Graduate Medical School Admissions Test GAMSAT. Academic ability is not the only pre-requisite for a career in medicine. Commitment, perseverance, initiative, originality, personal integrity, concern for others, and the ability to communicate are all essential. Good academic qualifications are normally required because the course is long and intellectually demanding. 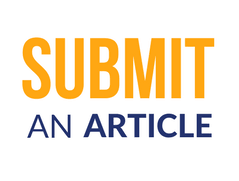 The exact requirements do differ between different medical schools. You are advised to check details with UCAS and/or the admissions department for the medical schools you are interested in applying to. Yes, in Sri Lanka some people think just getting high marks in A/L is enough to become a doctor and they are the best for the job. In most of the western countries you need to prove that you are a suitable human to become a doctor. are essential parts of the procedure. That is why they say, No preference is given to applicants who have majored in the sciences over those who have majored in the humanities. Academic ability is not the only pre-requisite for a career in medicine. Commitment, perseverance, initiative, originality, personal integrity, concern for others, and the ability to communicate are all essential. මේක මිනිස් ජීවිත සමග කරන කැපවීමක්. ඒක තමයි ඒ රටවල ඒවත් සලකා බලන්නේ. කොච්චර A ගත්තත් ඇතුලෙ ඉන්නෙ යකෙක් නම් දොස්තර වෙන්න බෑ . 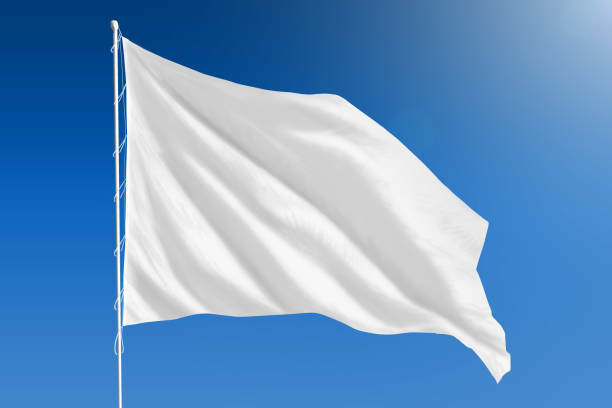 අපේ ඒව මනින ක්‍රමයක් නෑ. ඉතින් දෙවියන් හා යකුන් දෙගොල්ලම දොස්තරල වෙනව​. උන් තමයි දෙවියන්ටත් වසන්න බැරි තරමට අද මේ උතුම් වෘත්තීය කෙලසන්නේ. A/L වලදී වැඩියෙන් ම හොර කරපු එකාත් දොස්තර​. අපි පොඩි කාලෙ දොස්තර මහත්මයෙක් ගේ වාහනේ පැච් එකක් ගියත් මිනිස්සු වටවෙලා රෝදෙ මාරු කරල දෙනව. අද බල්ලෙක් ඕන නම් ලංවෙයි චූපාරක් දාන්න​. ඉතා කාරුණික පෙනුමින් යුතු වෛද්‍යවරියන් පාරේ පැච් ගිහින් අසරණව කෝල් දිදී ඉන්න ව දැක්කම මට සොඳුරු අතීතය සිහිපත් වෙනව​. ඔවුන් (GMOA) විවිධ අයිතිවාසිකම් දිනා ගන්න දුර දිග නොබලා ස්ට්‍රයික් සෙල්ලමක් පටන් ගත්තා. වසරක්පාසා ලෙඩුන් අසරන උනා. තමන් මහ ඉහල බලයක් සහිත අමුතූම වෘත්තිකයන් පිරිසක් කියා තමන් ද හිතා ගෙන අනුන්ටද පෙන්නුවා. වෛද්‍ය වර්ජන නිසා දුක් විඳින රෝගීන්ව නිති පතා මාද්‍ය වලින් හයි ලයිට් උනා. ටිකෙන් ටික ජනතාව ඔවුන් ගෙන් ඈත් කර ගත්ත​. ඔවුන් හිතුවෙ තමන් ජය ගන්නව කියා. අන්තිමේ දිනා ගත් දේට වඩා මහත් වූ වටිනා දේවල් , සල්ලි වලට ගන්න බැරි දේ නැතිකර ගත්තා. ඒ අයගේ වෘත්තීය සමිතියට කැම්පස් වල දේශපාලනේ කරපු සටන් කාමීන් ඇතුල්වීමෙන් පසු තමයි මේ වින්නැහිය සිද්දඋනේ. ඔවුන් බොහෝ අය පසුගාමී පවුල් පසුබිමින් ඇවිත් සටන මිස වෙනයම් වටිනාකම් ගැන අවබෝධයක් තිබුන අය නොවේ. අද වන විට පුද්ගලික වෛද්‍ය අද්‍යාපනයට විරුද්ධ සටනේදී ඔවුන් හුදකලා වී ඇත්තේ මේ නිසා. ඔවුන් ගෙන් බැට කාපු ජනතාව අද හිතනව මොනවටද අපි සහය දෙන්නෙ කියල​. එදා 1980 ගණන් වල එජාප පාලකයන් ත්‍රීමාවිතාන ලගෙ මොළවලට පරාල ඇන බස්සල බිම දිගේ ඇදගෙන යනවිට මිනිස්සූ ඔවුන් වෙනුවෙන් කම්පා උනා. ඒ සටනට අප පවා සහාය දුන්න​. නමුත් අද මිනිස්සුන් ට මේ දොස්තර මාෆියාව කොච්චර එපා වී ඇද්ද කියනවනම් වෛද්‍ය ශිෂයන්ට​ කඳුලු ගෑස් , බැටන් පොලු ප්‍රහාර දිනපතා එල්ල කළත් කාටවත් ගානක් නෑ. එහි සියලු වගකීම තමන් ගේ මෝඩ වැඩ නිසා තමන් ගේ ම තත්ත්වය බාල කරගත් දොස්තර සංගමය බාර ගත යුතුයි. අද පොදු ජනතා සහාය ලබෙන්නේ වැදගත් විදියට හැසිරෙන , වැදගත් ලෙස රැකියාව හා සේවය ලබාදෙන අයට. ඔහු ආවෙ දුප්පත් ගෙදරකින් ද ​, පොහොසතෙක් ලෙසද​, රජයේ වෛද්‍ය විද්‍යාලයෙන් ද , පිටරටින් ද​, පුද්ගලික අද්‍යාපනයෙන් ද A ලෙවල් වල ලකුණු කීයද ආදී කිසිවක් ජනතාවට අවශ්‍ය නෑ. නියමිත සුදුසුකම් සපුරා සේවය වැදගත් ලෙස ලැබෙනවා නම් එච්චරයි. දොස්තරලා වගේ ම ජනතාවත් ආත්මාර්ථකාමී වෙලා ඉවරයි. දොස්‍තරලා ගැන මහා ආත්මාර්ථකාමී පින්තූරයක් මැවෙද්දී ජනතාවගෙන් පරාර්ථකාමි වෙන්න කියා ඉල්ලුවට වැඩක් නෑ. @Chinwi wrote: Yes, in Sri Lanka some people think just getting high marks in A/L is enough to become a doctor and they are the best for the job. 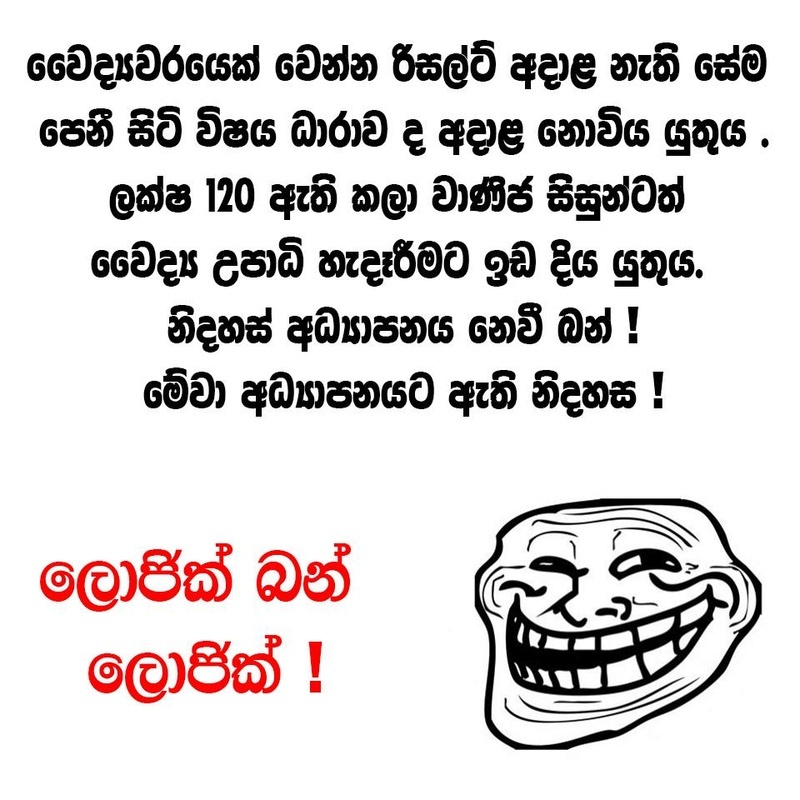 (SAITM) ලිං මැඩියන්??? they dont want A/L as min requirements, but want to be like US and Europe. I still believe our situation is different. Getting through in AL with district based highest marks is not necessary to become a good doctor. If you have common sense , good memory , smart and analytical thinking and good behavior qualities you can become a doctor or get qualified in most of other professions. The main requirement in our country related to medical profession is the English language. If you are not that fluent in English you will struggle in initial years and even people with 3S may go ahead of you. To get empowered in any expertise you have to understand the subject first. Then you need processing power. Then you have to present your knowledge to others. People think Doctors and Engineers from local Unis are the most intelligent people and if you are not among top ranks in A/Ls you cannot learn those subjects. This is another big myth spread in our society. This myth established here because of the abrasive selection process adopted by the governments to limit the intakes to the state universities to suit their limited capacity. Unfortunately many capable personalities surrendered to this artificial situation and had to settle in other areas during last half century. Some who had wealth or courage escaped this barrier by going abroad. They are performing well in other countries, in many professions. Now the world is opening to all mainly due to foreign travelling and internet , people are starting to think differently. If you couldn't perform in A/Ls due to any reason at that point of time, you still have the chance and time to do many other foundation or intermediate studies and then go to the world you like. Sometimes you may perform better than those who got direct placement because you are empowered with more practical experience which they do not possess. We are glad that the deans of the medical faculties of eight state universities have infused a voice of sanity into the prevailing madness over the SAITM controversy. 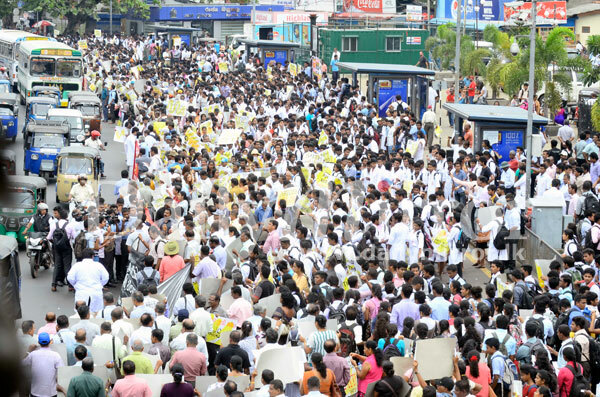 It was reported yesterday that they had a brief meeting with Higher Education Minister Lakshman Kiriella at the parliamentary complex where they handed a letter which stressed, among other matters, that the Sri Lanka Medical Council (SLMC) must remain the authorized institution for regulating the standards of doctors practicing in this country, its independence safeguarded and students who had qualified at SAITM be justly treated. 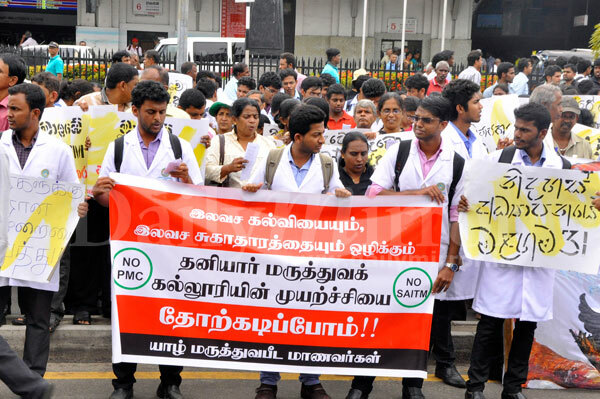 They have anslo suggested that SAITM students are afforded an opportunity of a few months of proper clinical training followed by an examination by the SLMC in order to determine their competence and that enrolment of new medical students be suspended until outstanding issues are resolved. 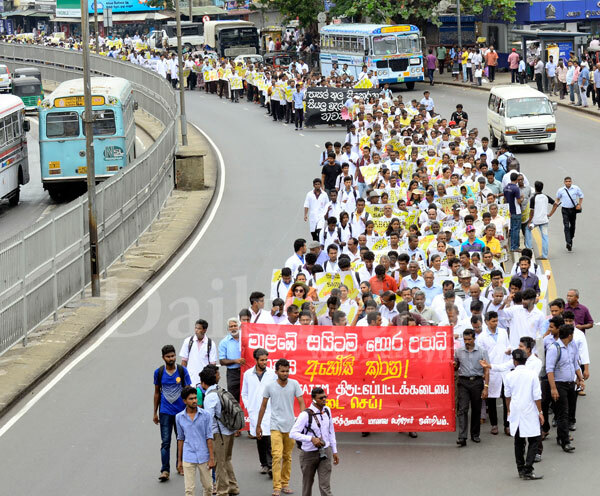 As far as we can see, only the dean of the Kotelawela Defence University (KDU) medical school has not signed. There have been allegations, how correct we do not know, that the standards demanded of SAITM have not been applied to KDU. That university is also a fee-levying institution. 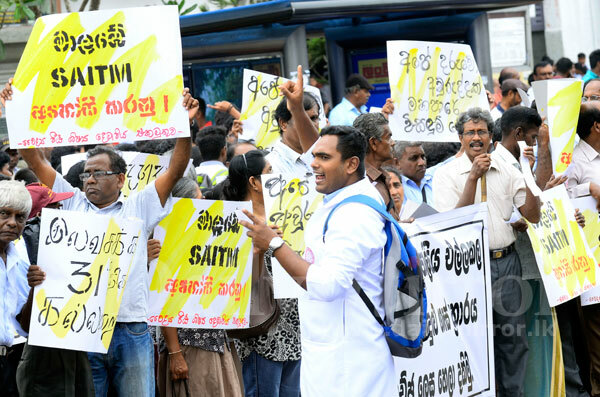 What is disgraceful about the controversy that has been swirling around SAITM these recent weeks, where even patients seeking treatment at government hospitals had to pay a price due to a GMOA token strike on that issue, is the double tongued approach of the Joint Opposition. During the previous regime, government scholarships were awarded to SAITM students, according to Prof. G.L. Pieris "on the expectation that SAITM would measure up to required standards". These standards were not met, he now says, but even if the claim were true it’s a essentially a case where the cart was put before the horse. The JO’s present stance has been determined for political advantage and nothing else. It will also be useful to remember that there probably would not have been a medical faculty at the Kelaniya University (Ragama) but for the fact that the Sri Lanka College of General Practioners, at great cost and energy, set up the private, fee-levying North Colombo Medical College (NCMC). The founders may have had the influence to win the support of then President J.R. Jayewardene, but they got nothing free from the government. Standards of entry were highly competitive and just 100 of over 1000 applicants were admitted in the first year. The late Prof. Stanley Kalpage, the then Secretary to the Ministry of Higher Education and Chairman of the University Grants Commission, told the final convocation of NCMC over two decades ago that many practicing GPs whose children could not win admission to the NCMC were unhappy. One doctor who got his daughter in but whose son failed to make it became an implacable enemy of the NCMC, he said. Following much agitation, with arguments very similar to what we are hearing now, the NCMC was taken over and attached to the Kelaniya University. Many doctors in practice today would not have had that opportunity had the NCMC not been set up. Given the cash-strapped status of succeeding governments, it is an open question whether the Kelaniya University would have had a medical school at all; even if it finally achieved one, it would have been realized much later but for the NCMC core. It would be relevant to find out how much foreign exchange flows out of this country to pay for Lankans studying medicine abroad. The collective figure over a period of years would run into the billions. The reality is that Sri Lanka lacks the resources to offer university places to all those students qualified for tertiary education especially for entry to the medical and engineering professions and perhaps law. This gap has been met by private fee-levying institutions, often linked to universities abroad. Except in the field of medicine, there has been no protest about the offering of these courses by the private sector. Dr. Neville Fernando set up SAITM as a commercial venture; but a large number of scholarships are on offer there. Providing a quality education in a discipline such as medicine will not come cheap. But not all students of SAITM come from affluent families with some parents mortgaging homes and property to invest in their children’s education. It wasn’t different during the NCSC controversy, but as Prof. Kalpage observed in his convocation address of long ago, most students there were children of teachers. Two eminent retired medical teachers, Emeritus Professor Herbert Aponso who taught pediatrics and Prof. Upali Ilangasekera, a former professor of medicine at Peradeniya, also made pertinent observations in Friday’s issue of The Island. They said that when they were examiners for the Act 16 examinations which Lankans who had acquired medical degrees abroad mainly in Russia and China (and some other countries) had to sit to qualify for registration as doctors here, they had found that the training, curriculum etc. in the countries where they studied was tailored to suit those conditions. The candidates were "awfully ignorant" of health problems and medical needs here. Sometimes they had to relearn and re-sit the exam several times but they had subsequently passed and proved to be efficient medical doctors. Thus though their initial training had not been adequate by SLMC standards, they were given an opportunity to come up to the acceptable requirements for Sri Lanka, they said. The former professors say that as far as they were aware, SAITM has a curriculum acceptable to Sri Lanka and the institution has been able to attract capable teachers. Perhaps the students have been handicapped by lack of exposure to sufficient clinical training – a matter that could be corrected. They have made the further point that the training that SAITM offers is in no way less (in fact much better) than what they have experienced in the training offered in some foreign countries. Professors Aponso and Ilangasekera suggested that SAITM graduates be offered provisional registration until they pass the ACT 16 exam – the same yardstick applied to foreign medical graduates. Thus a way forward has been clearly identified; it should be applied without caving into various pressures and vested interests as the JRJ government did in the case of the NCMC.